Step up to the ultimate in computer control with the award-winning Air Mouse Elite mouse. Control your PC or Mac on your desk or in the air from up to 100 feet away with just the wave of your hand. Harness the power of motion-sensing mouse technology to deliver presentations, browse the Internet nd more-all from across the room. 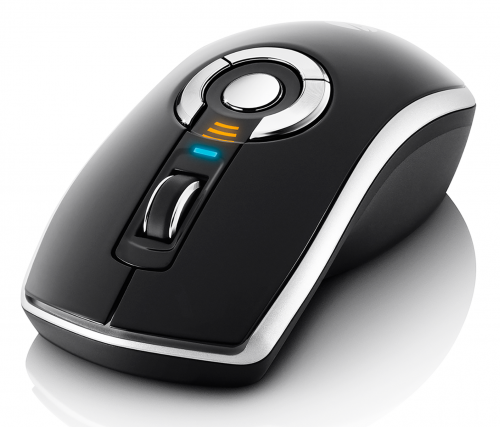 An elegant mouse for desktops and meeting rooms. Enables presentations from anywhere in the room. Step up to the Gyration Air Mouse Elite. Elite's elegant, award-winning design speaks volumes on your desk withoutsaying a word. And when it's time for your next business presentation, use the Gyration Elite to control your slides from up to 100 feet away--just with the wave of your hand. 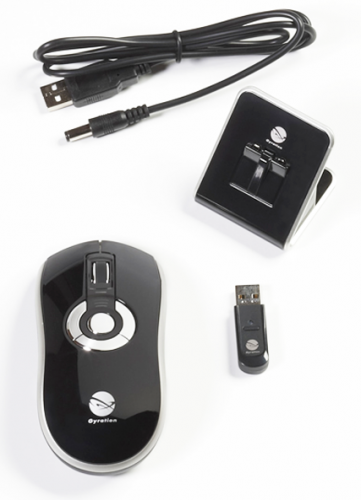 Enabling handheld control of computer applications, the award-winning Gyration Elite mouse is a natural addition to today's corporate boardrooms and company meeting rooms. On the meeting room table, it's a highly accurate laser mouse. Pick it up, however, and with the simple press of a button, Elite transforms into a full-featured gesture-controlled Air Mouse for interactive control of presentations, multimedia, video conferencing and Internet applications. WHY ELITE FOR MEETING ROOMS? Interactive control of meeting room computers. Available with Low Profile Wireless Keyboard. Wireless range is up to 100' (30 meters). 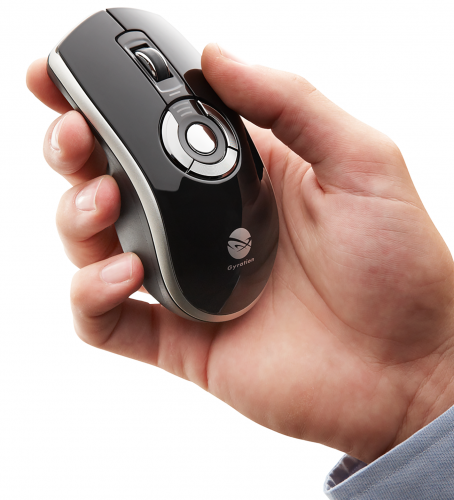 As educational instruction moves off of the desktop, the Gyration Air Mouse frees the teacher to move with it— transforming seamlessly from a desktop mouse into a handheld pointing device that enables classroom mobility and an interactive teaching style. More effective use of digital tools including flatscreen monitors, digital projectors and electronic whiteboards. Increased student participation and collaboration. To enable real-time dental 'in chair' patient consultation, the Gyration Air Mouse transforms from a desktop mouse into a handheld pointing device for digital x-ray reviews and interactive treatment planning. Interactivity in the operatory increases patient education, satisfaction and referrals. WHY "IN CHAIR" PATIENT CONSULTATION? Motiontools software, supplied exclusively by Gyration with Air Mouse products, enables customization of your Air Mouse buttons and hand gestures. Drawing from an extensive library of functions and screen effects, MotionTools enables presentation slide queuing, highlighting, annotation and zoom, media player controls, Internet navigation and much more. Use Gyration Motiontools software with your Air Mouse to make dynamic presentations and run classroom computers; or at home to navigate websites and play multimedia selections--all from the comfort of your couch.